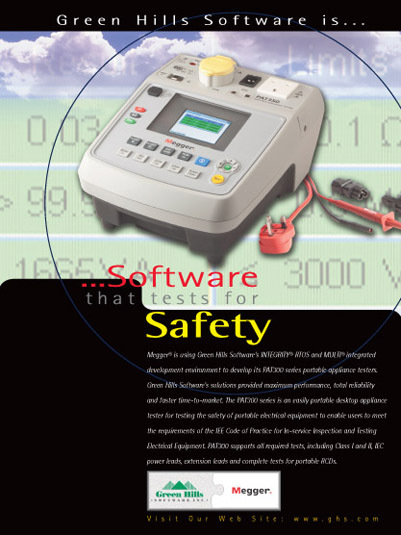 Megger is using Green Hills Software’s INTEGRITY RTOS and MULTI integrated development environment to develop its PAT300 series portable appliance testers. Green Hills Software’s solutions provided maximum performance, total reliability and faster time-to-market. The PAT300 series is an easily portable desktop appliance tester for testing the safety of portable electrical equipment to enable users to meet the requirements of the IEE Code of Practice for In-service Inspection and Testing Electrical Equipment. PAT300 supports all required tests, including Class I and II, IEC power leads, extension leads and complete tests for portable RCDs.